Underused station? Looking at the draft timetable it is interesting to note that the train lines and the station itself seem underused. For instance only 8 train services arrive at the station between 8am to 9am, which is the morning peak. On the other hand even less services leave the station. For instance only 9 train services are scheduled to leave the station in the 3 hour period between 6 am and 9 am. This seems a quite limited train service frequency for a main city train station with 8 platforms and one which recently had quadrupedal tracks installed for the initial 16 km run from the station. Punctuality. No mention is made of whether the scheduled services will become more punctual. 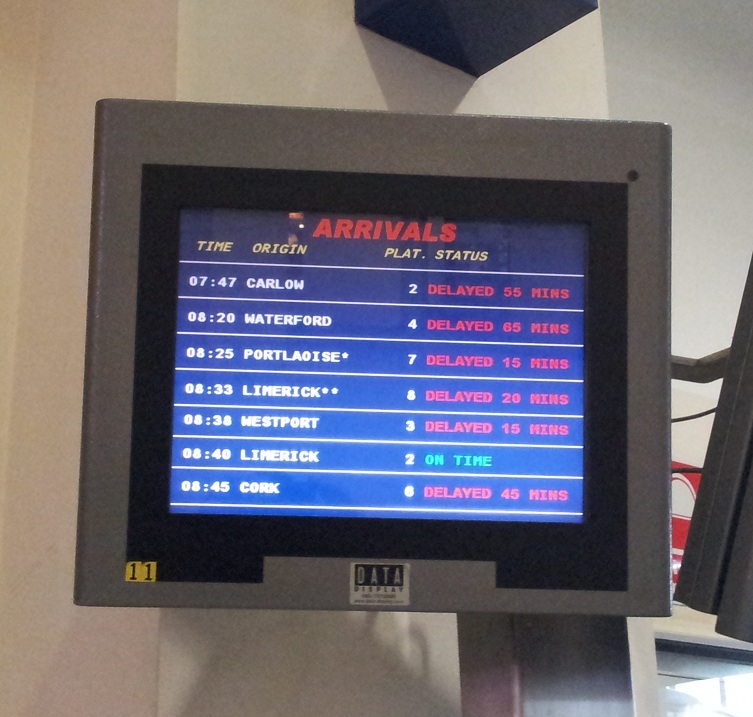 At present Irish Rail only consider a train service to be late if it is 10 minutes outside of its scheduled arrival time. But they have often have problems even meeting these loose limits. 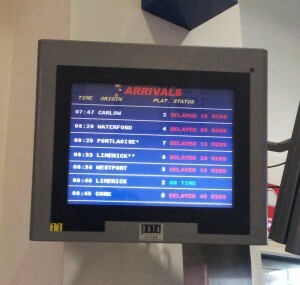 See below a photograph I took of a train arrival screen at Heuston Station last week. This photograph is not a very good advertisement for taking the train and it suggests if you do, you should take the earlier service to ensure you arrive on time. 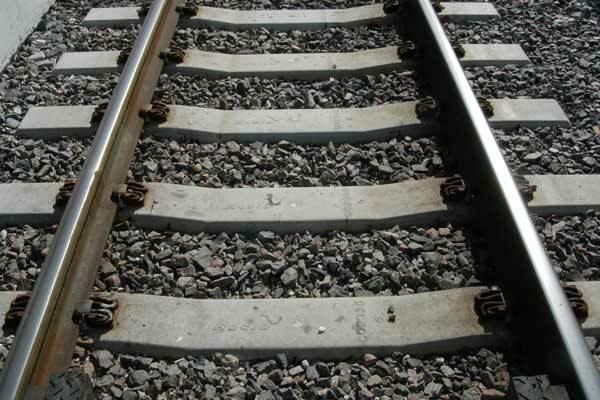 I have commented myself on the timetable and asked Irish Rail to consider among other things to increase the connectively of train services, which remains poor for the Galway and Waterford services and also asked that the 3 carriage trains be increased to 6, to increase capacity at peak times. In relation to train punctuality it is measure in relation to arrival time at destination and not arrival time at each intermediate stop. In other European Countries if a train arrives early at an intermediate stop it waits until the published departure time at that stop. If this happens here the train would leave early which is really useless for passengers trying to catch a train at an intermediate stop. 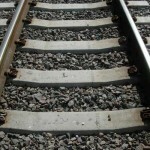 I irregularly travel on the Southeastern and Southern Train Operator services in south London. And, on the occassion, I have noticed trains leaving earlier than the timetable schedule. So if you’re catching a train on London Bridge Station, be aware that trains leave on the dot and sometimes up to a minute early. I assume this is to enable catch up on any delayed services throughout the day. Bearing in mind, the doors have to close before the train leaves. Ireland has so few trains, it’s nearly funny to say the least. I remember being stuck on the train for 2-3 hours on the Kildare train in 1993-1997 even after the Arrow Service was introduced. I use the Sligo train to/from Dublin on a regular basis. I find it a very good service,and well covered. My main gripe is the Time it takes complete the journey. I understand that there is only on line most of the way,and so trains have to meet on time for cross overs. Mostly this works well,but the journey takes too long . My request to Iarnrod Eireann is,to speed it up. The track has been up-graded,so there should be no reason that it cannot be made more competitive(you can drive the journey,without speeding,in 2.5hrs!! This day and age,journey times are the main reason more business people choose not to use the train. I have to agree. I use IE every day as part of my commute (Kildare line) and there is a distinct lack of pace from the drivers. The fact that a train needs to be more then 10 mins late to be considered ‘officially’ late doesn’t help!